One option to buy gold is through ETFs (Exchange Traded Funds). Another option to buy it is by purchasing shares of a gold mine: if the spot price goes up, theoretically the price of the shares should go up as well. But also we can use an ETF (vehicle) to buy shares of gold mines. 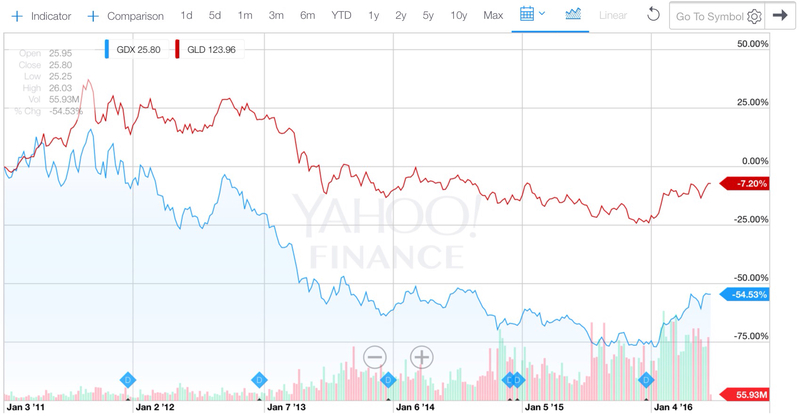 The most important gold ETFs is GLD: the fund mainly buys physical gold and deposits it in its vaults. Therefore the price of this ETF tracks the spot gold price. The other ETF we can use is GDX. GDX buys shares of consolidated gold mines, so it is a good reflection of the sector behavior. But which option is better? 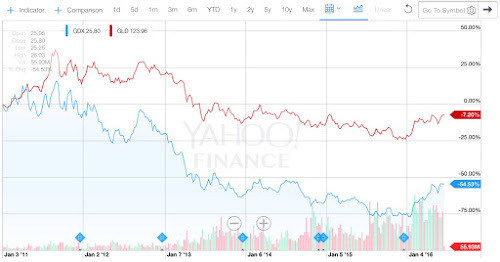 The blue line represents GDX, and the red line GLD, starting in the maximum price of 2011. The correlation was broken in 2012 and beginning of 2013. Perhaps now it is time to be broken again but on the other direction.